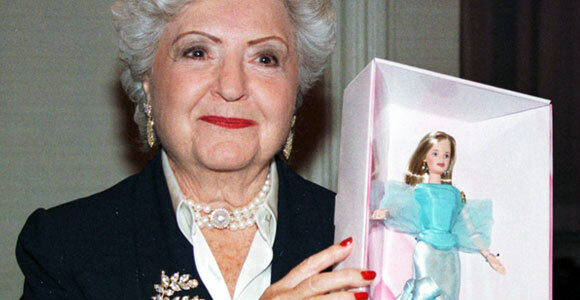 Ruth Handler (née Mosko) was an inventor and businesswoman, famous for being one of the founding members of the toy giant Mattel Inc. and for inventing the most famous doll in the world, namely Barbie. She was born on 4 November 1916 in Denver to an immigrant Jewish family, and married her high school friend Elliot Handler in 1938. The couple shifted to Los Angeles, where Elliot tried his hand at making plastic furniture. They set up a small business, with Ruth handling the sales aspect of the business and Elliot handling the manufacturing. The Handlers later formed a partnership with Elliot’s friend Harold Matson (nicknamed Matt) to manufacture plastic photograph frames in 1945. The name of the newfound company was “Mattel” – formed by combining the two names of Matt and Elliot. Using the scraps from frame manufacturing, Mattel began to produce dollhouse furniture – a move that was more profitable than they had anticipated. Thus, the company’s focus was shifted entirely to toy production. One of the first successful products produced by Mattel Inc. was a toy ukulele called “Uke-a-doodle”. A year after the formation of Mattel Inc., Matt sold his share of the business to the Handlers. The idea of creating the iconic “Barbie” doll came to Ruth Handler when she observed her daughter Barbara playing with paper dolls. Ruth noticed that paper dolls were a poor playmate as the clothes wouldn’t fit the doll properly and neither was it realistic enough to be fun. She also noticed that her daughter and her friends pretended that their dolls were “adults” with their own careers, lives, boyfriends, outfits and accessories. Ruth realized that girls no longer wanted to play with “baby dolls”; rather they wanted a doll that was a representation of what they wanted to be. Ruth suggested making a plastic doll with a realistic body but her suggestion was shot down. Elliot and other company executives were concerned that parents would be unwilling to let their daughters play with a doll that had a “voluptuous” figure. However, while on vacation in Europe, Ruth saw an adult German doll named Lilli with the same features that she had been hoping to introduce in her doll. She came home and redesigned her doll, including some of the features she had seen in Lilli. She named this doll “Barbie” after her daughter Barbara’s nickname. Barbie was launched at a toy fair in New York in 1959, but wasn’t very successful until an extensive 52 week advertisement campaign was run during a children’s television show called “The Mickey Mouse Club”. The advertisement campaign was Elliot’s brainchild and it was this that brought about the success of Barbie and subsequently, immense wealth and fame to the Handlers. The company went public in 1960 and Ruth Handler became the President in 1967. The success of Barbie led Mattel Inc. to become a Fortune 500 company and production of Barbie was expanded overseas, including a wholly-owned subsidiary, Mattel S.A. in Switzerland. Barbie dolls became a “must have” toy for every little girl and is still considered by many to be an American cultural icon. Barbie has evolved with the times, including her clothes, hairstyles, cars and careers. Barbie has often been criticized for her “unrealistic” proportions and inducing a sense of inferiority in young girls. The Handlers slowly became less involved in business, especially after she was diagnosed with breast cancer in 1970. She was successfully treated for it, and after her recovery, formed a company by the name of “Ruthton Corp” to manufacture realistic looking breast implants named “Nearly Me”. Ruth Handler died during surgery for colon cancer in 2002 at the age of 85.